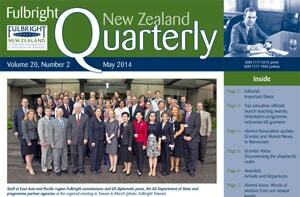 The May 2014 edition of our Fulbright New Zealand Quarterly newsletter is online now! 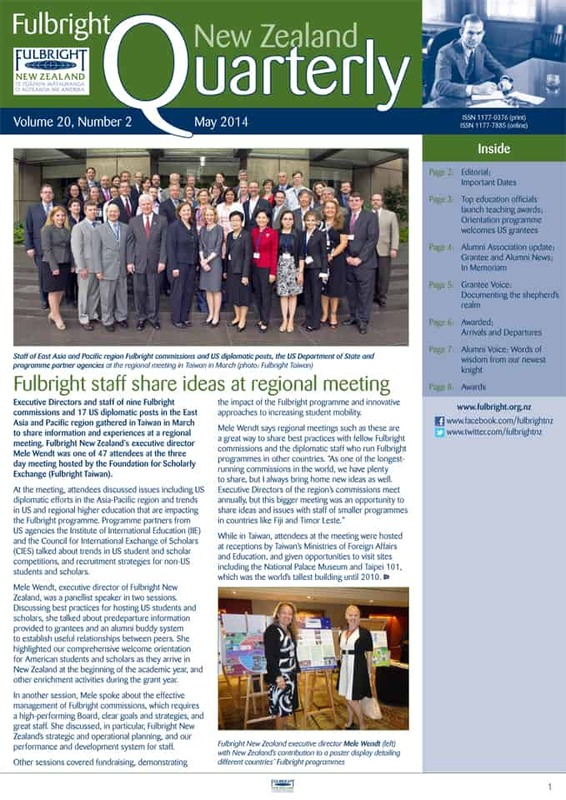 In this issue, read about a recent East Asia and Pacific regional Fulbright meeting in Taiwan, the official launch of the Fulbright Distinguished Awards in Teaching programme at parliament in Wellington, and our February orientation to welcome this year’s US grantees to New Zealand. Current Fulbright US graduate student Andrew Fladeboe reports on his exchange to New Zealand, recently-knighted New Zealand alumnus Sir Toby Curtis answers an ‘Alumni Voice’ Q&A, and we have the usual news updates from the Fulbright New Zealand office and the Fulbright New Zealand Alumni Association, details of our latest grantees, grantee and alumni news in brief, and a full list of available awards.